Fund for Assistance to the ROCOR - “Mission members are relying on Orthodox support...” – an interview with priest Matthew Williams. 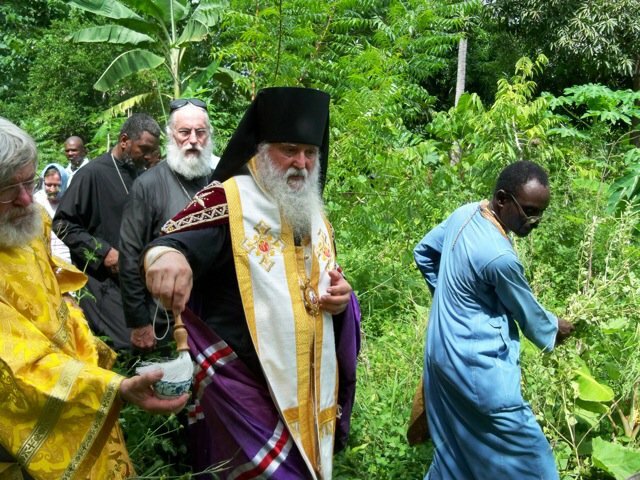 "MISSION MEMBERS ARE RELYING ON ORTHODOX SUPPORT..."
Bishop Michael blesses Haiti Mission's land in Jacmel, Haiti. New York - After his recent return from a five-day trip to Haiti, Fr. Matthew Williams, assistant administrator of the ROCOR Mission in Haiti, recounted his impression of the mission’s current situation. The group was lead by His Grace Bishop Michael of Geneva and Western Europe; he was accompanied by Archpriest Daniel McKenzie, administrator of the mission, his wife Sophia, as well as deacon Andrei Roudenko. Fund for Assistance: What was the purpose of this trip? Fr. Matthew Williams: The main purpose of this trip was to provide moral support to the mission and to gain a deeper understanding of the needs of the mission following the earthquake in January. We visited four of the 7 parishes: in Jacmel, Leogane, Fontamara (part of Port-au-Prince) and the main church in Port-au-Prince – the Nativity of the Theotokos. FFA: What was your impression of the life in Haiti now? 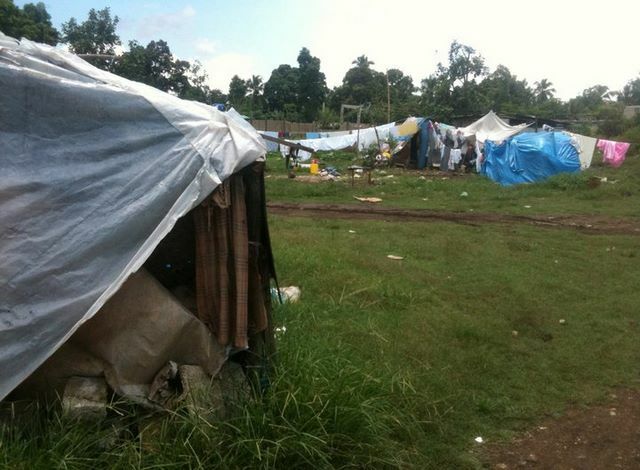 FM: A large percentage of the population is still living in tents. In the Port-au-Prince area especially, there are huge tent cities. That includes many of our mission members. Conditions are very poor. Life won’t probably back to normal even by Haitian standards for a long time. Haitian standards of normal living are very different from what we are used to. For example, running water has never been a norm, nor has electricity been available at all times. It’s available for a few hours a day usually. FFA: What has changed since your last visit? FMW: One of the most noticeable things is that many of the NGOs are gone. I only saw one or two indications of the presence of NGOs for the time I was there. It means that the members of our mission and others are not getting the assistance that they need and that had been promised to them by the world community. They haven’t been receiving aid from other organizations, and the members of our mission are relying on Orthodox support. Seems like that plight of Haiti has come off the radar in many different circles. The media makes little mention of it. I recently read that the vast majority, over 90 per cent of the assistance that was promised to Haiti by the world community, has not been delivered. Small Orthodox tent city in Leogane. FFA: What’s been going on in the mission since your last visit? FMW: I went to Haiti right after the earthquake in January when the whole country was in chaos. Since then the two churches that are owned by the mission and have been damaged in the earthquake have been repaired. These are the Church of St. Moses in Fontamara, Port-au-Prince and the Church of Nativity of the Theotokos in Port-au-Prince. The parish schools have reopened, and the mission’s church life seems to be stabilizing. FFA: How are members of the mission living? What is their situation? FMW: There’s a broad range of living conditions within the mission. Some of them seem to have ok housing, and have some personal resources. But many of the members, especially in Leogane, are living in tents and have very little resources if they have them at all. FFA: During her visit to Washington, DC last February Matushka Rose Legoute, wife of Fr. Gregoire, said that children in Haiti have been so traumatized by the earthquake, they are not interested in playing and don’t show normal child behavior. Has this changed? FMW: Fr. Gregoire’s children don’t seem to play very much. I gave toys to both of his daughters; they were appreciative but didn’t seem to be terribly interested. That may be an indication that the situation hasn’t changed much, or maybe the toys I brought weren’t very nice. FFA: How was this trip different from the previous one? FMW: The trip in January was an extremely difficult one. When I left for Haiti, I had no idea if the mission had survived, if any of the clergy were still alive. The emotional preparation was very different. While I was there we were concentrating on providing medical attention, and visiting a few parishes we could reach to make an initial assessment. This trip was much better planned. We served Liturgy twice in the five days, served a moleben of Thanksgiving in Jacmel, blessed the land in Jacmel where the church is going to be built. There was a deacon ordained, his name is Fr. Jules and he is Fr. Jean’s brother. He will be serving in the short term in the Nativity of the Theotokos parish in Port-au-Prince. He is also, God willing, will be attending seminary in France. Fourteen readers were tonsured from six parishes, there were supposed to be two more but they got stuck in traffic and couldn’t get to Liturgy on time. They will be helping conduct reader services when the priests are not there. Five members of the mission have been accepted into the Seminary of the Moscow Patriarchate in France. They are now waiting for the visas. FFA: What are the mission’s greatest needs right now? FDM: They need help in three different areas. The first is the daily support of the mission. The clergy have to travel to seven parishes, which costs money. The members of the parishes don’t have the resources to support their clergy. Also, there are two projects that have been established with +Metropolitan Hilarion’s blessing. One is the Haiti Orthodox Family Relief Program, which is a way for parishes and individuals to sponsor the support of specific families chosen by the mission’s priests in Haiti to receive assistance. 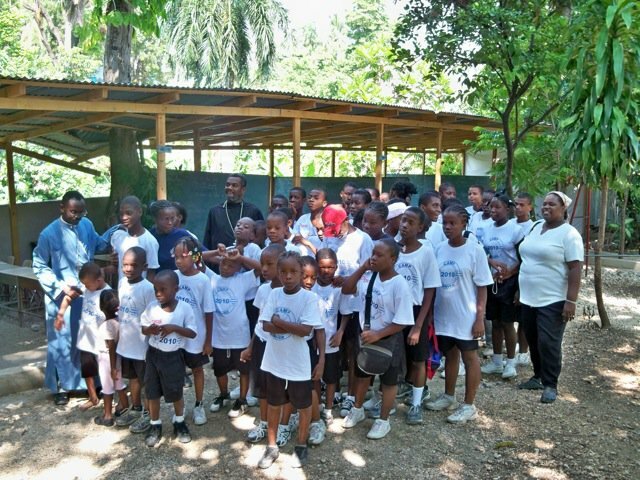 It gives donors and parishes an opportunity to establish a relationship with those they are helping in Haiti. The second project is the building of a church in Jacmel, which is a thriving community dedicated to St. Augustine. It is a few hours away from Port-au-Prince. Vladyka Hilarion has also blessed the mission to establish a building fund to eventually build a proper church on the mission’s land. What is most needful for the mission however, are the prayers of the faithful. We ask for the clergy: Frs. Jean, Gregory, and Jules, as well as the rest of the members of the mission to be remembered in everyone’s prayers. "Members of the Haiti mission are afraid of the future..." an interview with Deacon Matthew Williams.